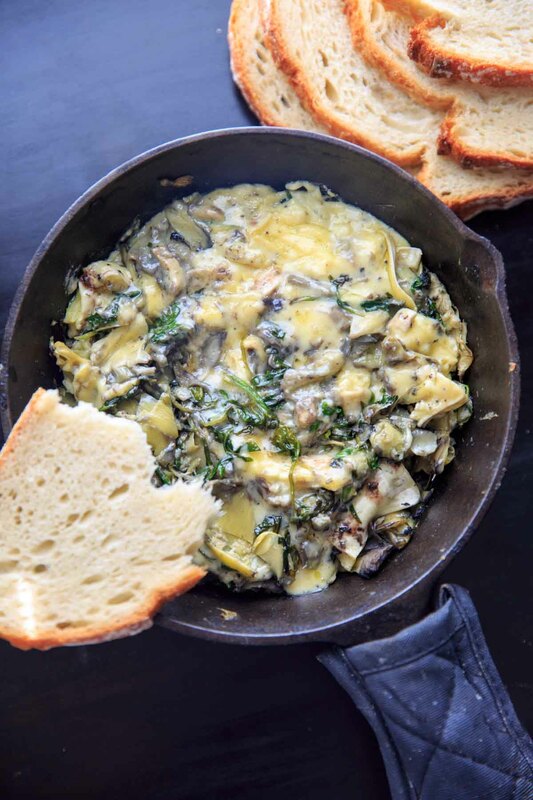 Arugula (or spinach) and artichoke brie dip, made in a cast iron skillet. A delicious and unique appetizer! 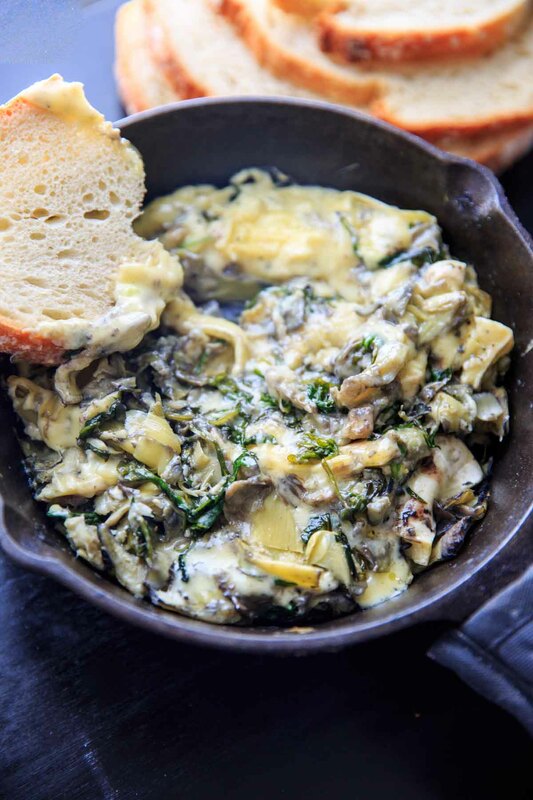 Click here to save this Skillet Brie Dip recipe on Pinterest! I almost always have a wheel of brie in my fridge. You know – in case of emergencies. I’ve long had on my list to try a brie dip of some kind. 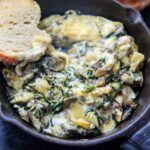 So when I found this recipe, I knew it was about time! Greens were a spur of the moment decision, but it works well. Like spinach and artichoke dip, except I only had arugula. 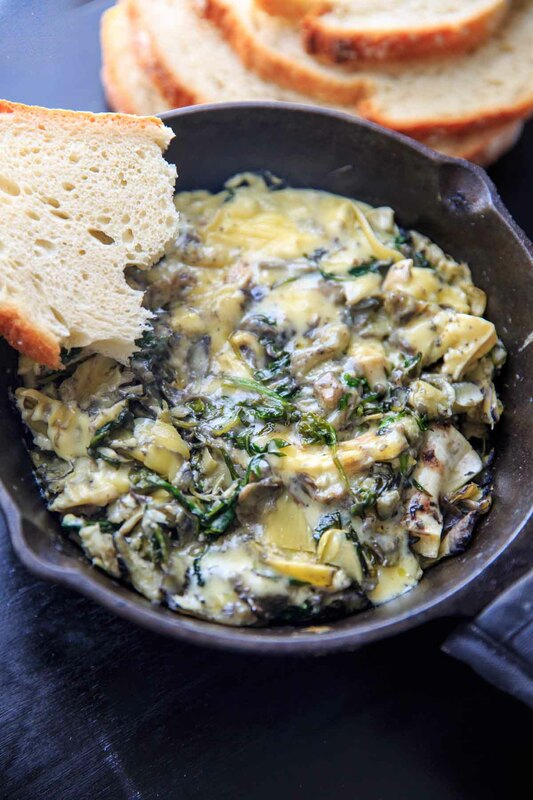 So an arugula artichoke dip, made from brie! Arugula doesn’t cook down QUITE as much as spinach does, but you can sub spinach if you prefer. Thoroughly drain the artichoke hearts and squeeze out extra water before roughly chopping and tossing them in there. Then slice the brie cheese (remove the rind if you want, but it all tastes the same in the end to me) and melt just a bit before tossing it in the oven. You’ll end up with this gooey, delicious dip, perfect for dipping some bread into. BONUS if you have a flavored brie for an extra twist of flavor. I like a kind that Trader Joe’s carries that is brie with truffles! If you don’t have one like that, you can choose to add in some extra flavor with herbs. Rosemary and thyme are my favorites with brie. Or if you like the idea of the truffle flavor, saute the greens in truffle oil OR top off with a dash of truffle salt. But don’t you worry, this dip is plenty delicious without those too! I listed this as 4 servings, but it could just as easily be 1 for the true brie lovers. You better get to it fast! 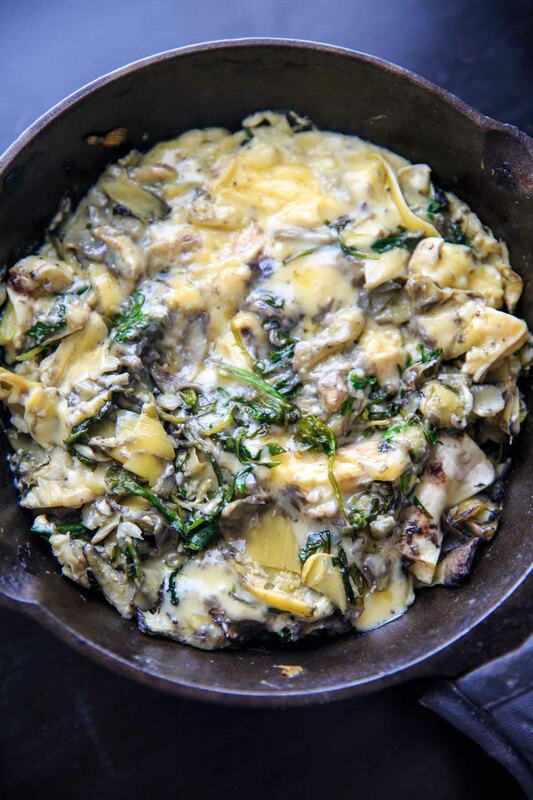 In a 10-inch cast iron skillet, heat oil over medium heat. 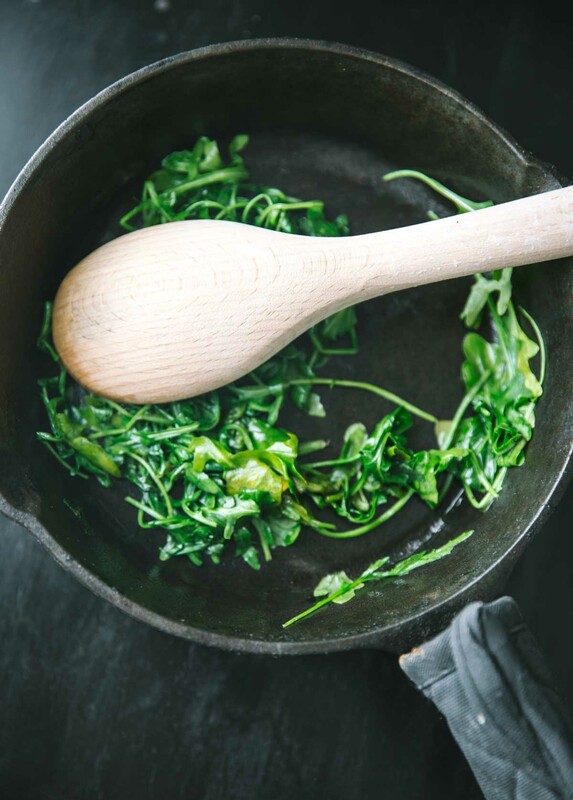 Once oil is hot, add in minced garlic and arugula and saute until greens are slightly wilted, about 2-3 minutes. 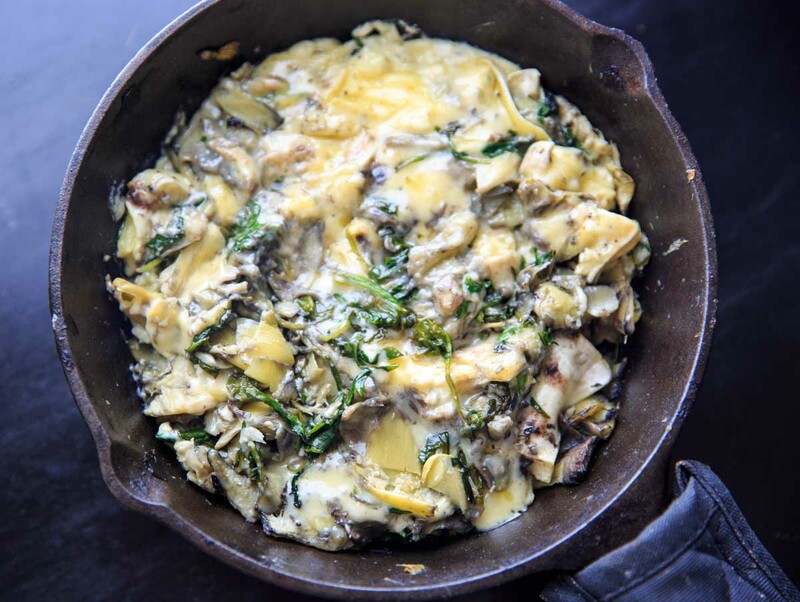 Add in chopped artichoke hearts and brie cheese slices. Keep over medium heat for 2-3 minutes until slightly melted (enough to give it a quick stir together). Bake at 350°F for 10-15 minutes or until cheese is melted and bubbly. Sprinkle salt (if using), give it a stir, and serve with crusty bread or veggies.